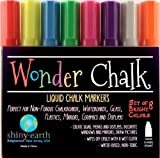 Wonder Chalk Liquid Markers-Water Based, Wet Wipe to Erase-These 6mm Chisel Tip Premium Chalk Ink Pens in 8 Neon Colors are Ideal for Whiteboards, Plastic, Glass, Kids Crafts and Non-Porous Blackboards, Chalkboards-sold exclusively by shiny•earth (UPC 820103240963) is sold at the following online stores. We've find the latest prices so you can compare prices and save money when making your purchases online. Please click on the links below to browse to each store's webpage.